The UM-Dearborn men’s hockey team played their final series of the season against the Oakland University Golden Grizzlies. 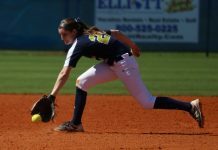 The Wolverines dominated the Golden Grizzlies in both games with scores of 7-1 on Friday night and 7-0 Saturday night. 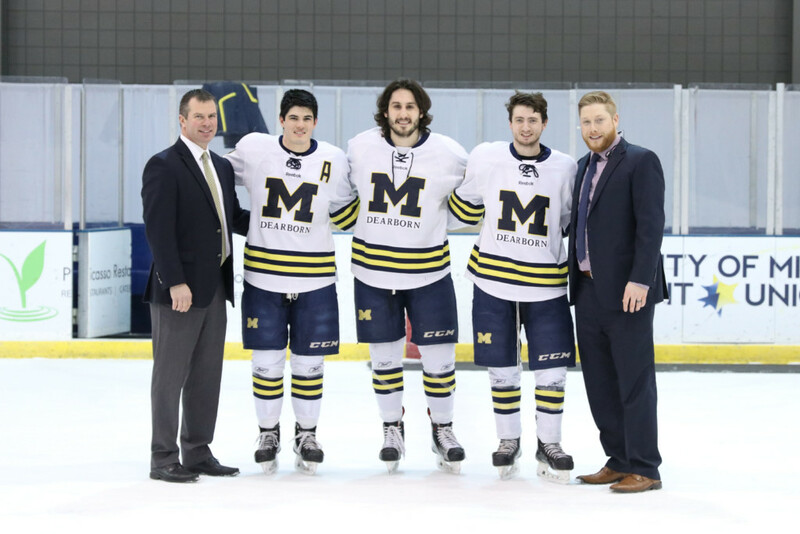 The Wolverines first played at the UM-Dearborn Fieldhouse Friday night on Senior Night. The team honored three seniors during the first intermission: Marcus McSweeney, Mike Scarpello, and Andrew Palushaj. Each honoree was given a framed photo and had pictures taken on the ice with family and coaches Chris Haltinner and Rick DeSana. All three seniors started the game along with juniors Troy Saunders and captain Kevin Bechard. Junior Thomas Proudlock was the goaltender. The Wolverines started heavy, peppering the Golden Grizzly goalie with shots. They spent most of the first period in the Grizzly end of the ice. The Wolverines got their first goal from Kevin Bechard on a power play early in the first period with an assist from McSweeney and freshman Billy Brock. Shortly after, junior Tyler Groat scored the first of two goals in the game assisted by Brock. The next Wolverine goal would be the first of many to come from freshman John Ames assisted by McSweeney and sophomore Justin Dunn, making the score 3-0. This was Ames’ first goal of the season. Billy Brock would then score on a pass by Tyler Groat making the score 4-0 with less than two minutes remaining in the period. Chandler Gillespie of the Golden Grizzlies would find the back of the net on a broken play to make the score 4-1 after one period. The Golden Grizzlies would come out of the locker room with a renewed speed on both ends of the ice. They peppered Proudlock with shots in the second and third periods but none found their way behind him. The third period would find both teams down a player after late penalties in the second period. Both teams killed the penalties, but at 4:01 in the third, sophomore Christian Ramage would score an assisted goal making the score 5-1. Andrew Palushaj found the back of the net shortly afterwards with assists from Groat and McSweeney. At 16:02 in the third, Groat would score his second goal of the game with assists from Ames and Palushaj. This was the final score as the Wolverines won 7-1. Proudlock stopped 23 of the 24 shots he faced. The Wolverines had 35 shots during the game. 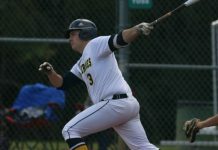 “Tommy played really solid. I am not even going to blame that [one goal] on hi–it was a bang bang play and it wasn’t even his fault. We need that kind of play if we want to go deep.” Haltinner said about Thomas Proudlock’s play after the game. 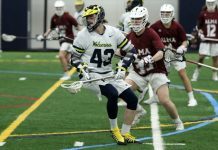 The Wolverines also traveled to Rochester, Michigan on Saturday night for their final game of the regular season to once again play the Golden Grizzlies. No stats were reported for this game besides the 7-0 walloping the Wolverines gave the Golden Grizzlies on their home ice. The UM-Dearborn Men’s Ice Hockey Twitter account listed goals from junior Jared Dedenbach, Tyler Groat, Billy Brock (2), and Troy Saunders. Assists by Justin Dunn (3), Marcus McSweeney, freshman Sean McLaren, Tyler Groat, junior Michael Hodgson, and John Ames. The UM-Dearborn men’s hockey team now enters tournament play with a regular season record of 21-4-2 overall and a conference record of 8-3-1. The No. 3 Wolverines will play Thursday night at 7 p.m. at the Ann Arbor Ice Cube as they face off against the No. 6 ranked Eastern Michigan University Eagles in the first round of the GLCHL (Great Lakes Collegiate Hockey League).